Sunwarrior announces a new partnership with Mike Adams of Natural News, Garden of Life, and other health advocates to raise the standard on natural ingredients. This marks a milestone for food safety and protections for consumers. Sunwarrior, a plant-based supplement company in Southern Nevada, is excited to join a new industry accord with Mike Adams (The Health Ranger), Garden of Life and other leading health advocates. They will combine forces to seek higher standards from farmers and suppliers. Together they hope to change the way food, especially rice, is grown, improving the ingredients that go into health-food products at the source. The initial focus of this accord is to lower the heavy metals that are naturally more prevalent in some foods (click here for a list of common foods naturally high in heavy metals). "This marks a milestone for food safety and protections for consumers," said Mike Adams, health advocate and editor of Natural News. Heavy metals are in everything grown in soil. These metals naturally exist in the earth’s crust, in our air, and in our water. They appear frequently in foods that require more water, like brown rice, root vegetables, and greens (infographic). They are unavoidable, but the body does an amazing job removing these minute amounts, especially the safer, organic forms that exist in plants. This doesn’t mean people shouldn’t pay attention to their exposure. Sunwarrior products already follow a high standard and they will work with Mike Adams to raise those standards even higher. Their rice protein falls well below FDA, WHO, and EU guidelines in every test. Sunwarrior products are safe. If people are still concerned with rice, they can make the switch to Warrior Blend, which doesn’t contain any rice protein and consistently tests far lower, negligible, for any heavy metals across the board. Natural News provides many ways here to reduce the risks of heavy metals by relying on natural foods that form organic bonds with minerals and aid in their removal, often referred to as chelates. Sulfur, amino acids, and alpha lipoic acid found in spinach, parsley, peas, and brown rice all help the body remove heavy metals. These are also found in Sunwarrior products. The key mission of Natural News is to empower consumers with factual information about the synthetic chemicals, heavy metals, hormone disruptors and other chemicals found in foods, medicines, personal care products, children's toys, and other items. Natural News covers holistic health, nutritional therapies, consciousness and spirituality, permaculture, organics, animal rights, environmental health, food and superfoods, and performance nutrition. Natural News also warns its readers about science gone bad and frequently cites examples of science resulting in catastrophes that it calls "crimes" against humanity. Sunwarrior’s mission is to illuminate body, mind, and planet. Sunwarrior relies on the original power from sunlight, captured by the wonderful plants found in nature, to change the way the world looks at fitness and nutrition. Sunwarrior has grown rapidly since its inception many years ago at the Sedona Raw Food Festival. Sunwarrior now offers several raw, vegan products that are perfect for anyone and any lifestyle: two delicious protein powders to build muscle and speed recovery, activated barley for enhanced endurance, supergreens for probiotics, and liquid mineral complexes that nourish cellular function and boost the immune system with vital macro and trace minerals, like magnesium, iron, copper, selenium, and ionic silver. Join them in their mission to share the health and healing energy from captured sunlight with everyone and truly transform the planet, one warrior at a time. 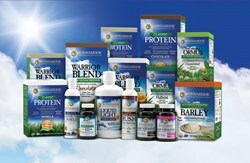 For more information about Sunwarrior visit http://www.sunwarrior.com. For more information about Natural News visit http://www.naturalnews.com.